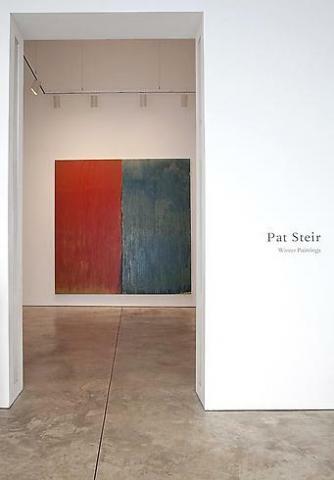 Cheim & Read is pleased to announce an exhibition of recent paintings by Pat Steir. The show is accompanied by a full color catalogue with essays by Kay Larson and Matthew Israel. Steir’s last show with Cheim & Read was in 2007. Born in Newark, New Jersey, in 1940, Pat Steir received her BFA from Pratt Institute in 1962. Her work has been shown almost continually since graduation. After debuting in a few group shows, including Drawings at the Museum of Modern Art, she had her first solo exhibition at Terry Dintenfass Gallery in 1964. Though with her early work Steir was loosely allied with Conceptual Art and Minimalism, she is best-recognized for dripped, splashed and poured “waterfall” paintings which she first started in the late 1980s. As Larson explores in her catalogue essay for the show, Steir’s continuous search for the essence of painting guided her to John Cage, who she met in 1980, and Agnes Martin, who she visited in New Mexico every year for 30 years, until Martin’s death in 2004. These two artists provided Steir with enviable mentorship. From Cage, Steir learned the importance of “non-doing,” the role of chance, and the separation of ego. Martin showed her the “magic” of work in which the artist “invest[ed] their spirit into an object.” Both lessons found direction in Steir’s poured-paint paintings: paint, once applied, flows downwards, its serendipitous path routed by its own unpredictable journey. Steir, intentionally removing herself from the action allowing gravity, time and the environment to determine the work’s result. She positions nature and its elemental forces as active participants. In this vein, Steir is also profoundly influenced by Chinese painting traditions and techniques, especially the inky marks of the 8th and 9th century Yi-pin “ink-splashing” painters, and Taoist philosophy’s aspiration for harmonious, unfettered connections between man, nature and the cosmos.